Okay. Today I have five things. 1. Go over to Sea of Shoes NOW and ogle at Jane's recent post of pictures of her bedroom. Look. At. All. Those. Shoes. It's insane. If you're being lazy and can't find the energy required to drag your cursor over to your search bar, here is the link! Isn't it beautiful? I'm sort of into that whole old school vibe; poufy skirts with tucked in loose tops with a belt at the waist. It gives you the ultimate hourglass silhouette, doesn't it? 3. Betsey Johnson. Ever since I entered that little drawing contest over at Sea of Shoes, I've been absolutely obsessed with Betsey Johnson. Her dresses are so colorful, and vibrant on the runway, and the ones she has for sale on her website are so fun and flirty. I want one for my grad dress more than anything! Here are some of my favs from the website. The last two are my favorites. :D And just now, I noticed it's the same model in all of those pictures... Coincidence? Probably. 4. 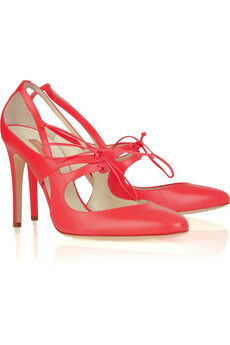 Rupert Sanderson. Since I've started stalking the Outnet, I've noticed some of his shoes popping up. And I LOVE them. 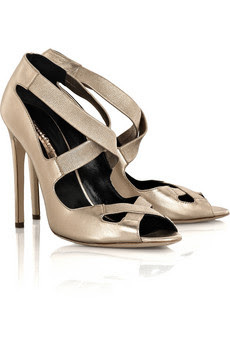 Particularly, I love these two(which come in my size, and cost a little under $300 a pair on this website). Aren't they lovely? I'd wear them with anything! Except for... Never mind. I'd wear them with anything. 5. Clique eyeliner in Starry Plum. Got this eyeliner a few weeks ago, and I'm back for more. Such a pretty color with brown eyes, and it doesn't go on too dark. 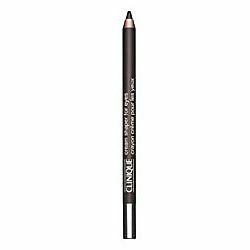 Great for smokey eyes as well, because it smudges pretty easily. And, it's less than $15 at Sephora, Macy's, or Boston Store! Go figure! Welcome to the plant of Amy. Population: one crazy teenager with nothing better to do than rant about her life on the internet. Let the insanity begin. No one morns the wicked.